Jim Federico once reported directly to Barra in 2011 when she became head of global product development. 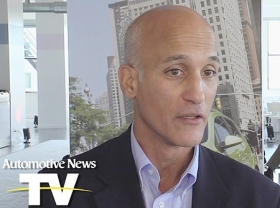 DETROIT -- General Motors said today that engineering executive Jim Federico has retired, the second high-level engineer to depart in recent weeks as GM shuffles its product development structure in the wake of its recall crisis. Federico, 56, a top GM engineer who in recent years led the company’s global small-car development and vehicle integration, is retiring after a 36-year GM career “to take on new engineering and design challenges outside of the auto industry,” according to an internal e-mail dated today and obtained by Automotive News. Federico led a team of GM engineers in the fall of 2012 that analyzed a defective ignition switch, more than a year before GM recalled 2.6 million cars with the part. GM is the subject of at least four federal probes into its handling of the faulty switch, which the company has linked to at least 13 deaths since 2004. GM has said its engineers discovered as early as 2001 that the switch could slip out of the run position, disabling power steering and airbags. A GM spokesman confirmed Federico’s decision to retire, saying it is unrelated to the ignition switch issue. His departure is effective immediately. Federico in October 2012 oversaw a group of engineers that discussed whether to increase the torque on the switch to prevent it from slipping, according to a document released last month by a congressional committee investigating GM's handling of the switch defect. The team also explored why the defective ignition switch was keeping sensors in the cars from deploying airbags. Lance Cooper, the lawyer who deposed Stouffer while representing the family of a Georgia woman who died in 2010 when her Chevrolet Cobalt crashed, told Automotive News in March that Federico was the next GM employee he planned to depose. Instead, GM settled the case in September 2013. On April 22, GM said that John Calabrese, 55, vice president of global engineering, would retire as part of a plan to divide GM's engineering organization into two divisions. GM product-development chief Mark Reuss said at the time that Calabrese's departure was not related to the ignition switch issue. Also last month, GM CEO Mary Barra said that the company has suspended two engineers with pay in connection with GM's internal probe of the ignition switch problem. Federico reported directly to Barra beginning in 2011, when she became head of global product development. In late 2011, as GM’s chief engineer for electric vehicles, Federico spoke out in defense of the Chevrolet Volt after one of the cars caught fire following a government crash test. Today's internal memo from Ken Morris, promoted in last month's restructuring to vice president of Global Product Integrity, calls Federico "one of GM's leading and accomplished engineers." Federico was either chief engineer or vehicle line executive on the development of several core GM vehicles in recent years, including the Buick LaCrosse, Regal and Verano and Encore; the Opel Insignia, Mokka and Adam; and the Chevy Cruze, Sonic and Spark. Federico began his GM career at a Chevrolet rear-axle plant in Buffalo, N.Y. He held high-level engineering posts at Oldsmobile and Cadillac and on GM's truck-development team. "We thank Jim for his many contributions and wish him the best in his next adventure," Morris says in the memo.